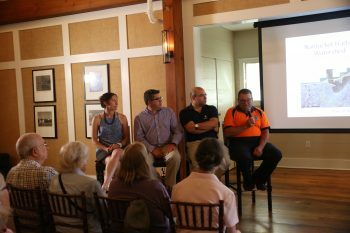 The Nantucket Land Council held the second annual State of the Harbor Forum on July 19, 2018 at the Great Harbor Yacht Club. Attendees were presented with an update on the sewer failure and plans for future sewer infrastructure upgrades by David Gray of the Nantucket Wastewater Treatment Plant. Nantucket Land Council Executive Director Cormac Collier facilitated a question and answer session with local Town of Nantucket department heads and organization leaders including: Jeff Carlson – Town of Nantucket, Emily Molden – Nantucket Land Council, David Gray – Wastewater Treatment Plant, and Roberto Santamaria – Nantucket Department of Health. Topics discussed included: water quality, eelgrass and shellfish, sewer system and much more. See full video of the 2018 State of the Harbor Forum below and click the link for the 2018 Nantucket Sewer Department Presentation and the 2018 NLC State of the Harbor slideshow. Please save the date for the third annual State of the Harbor Forum which will be held in July 11, 2019. Stay tuned for more details. 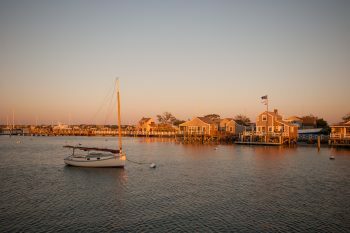 For sponsorship opportunities or other questions, please call (508) 228-2818 or email meg@nantucketlandcouncil.org.